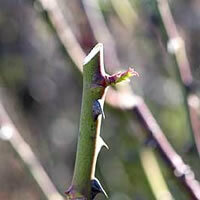 Every rose grower should take the time to educate themselves on the proper pruning of their roses. Pruning is not just a practice to make the plant look nice, but it performs a valuable service towards keeping your roses healthy and performing. Let's face it, the whole reason we grow roses in the first place is because we want our gardens filled with as many stunning blooms as we can possibly get. Learning when to prune roses is essential towards achieving this goal. 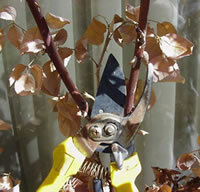 Now I have heard many growers say pruning is difficult and tedious and they are not sure how to do it properly. The latter may possibly be true, however pruning in general is easier than most people believe and it only takes a few minutes per plant to get the job done with a simple pair of hand shears. So for the gardeners who fall into that second situation, not knowing how or when to prune roses, we wrote this article to help guide them through the process. While there are a few exceptions to every rule, and you really should take the time to educate yourself on your specific types of roses, as a general rule of thumb pruning roses is almost always done in early spring or late winter, depending on your climate. You want to get to them before the leaves start opening if possible, but not before the really hard freezing temperatures are done. This is something you have to learn for your particular region as the timing is just a little different for everyone. You can even ask someone at your local nursery if you want to be absolutely certain. If you prune your roses too early, the open wounds will not respond well to freezing temperatures if they are exposed for long periods of time. Obviously this is counter-productive to the whole process of pruning in the first place. Conversely, if you wait too long and the leaves start opening and are gathering sun light, you run the risk of severely shocking the plant and stunting its growth for that season. It's best to get to the plant before it starts establishing new leaves and shoots, so that it's not wasting energy producing parts you're just going to cut off anyway. Knowing when to prune roses is key to a successful start to the growing season. The first step in pruning roses is to go through and remove all the dead wood on the plant. I will usually also go through and cut off any canes that look unhealthy and overly discolored. In my experiences, I've had better success just letting the plant start new growth than I have trying to rehabilitate unhealthy ones. This makes a lot of sense early on in the year when the rose bush hasn't even fully come out of dormancy yet. You can use this step to also train your roses to grow a certain way, such as climbing roses and ramblers. Prune back the cane to the closest bud that faces the direction you would like the plant to grow. This is less of a concern on smaller rose bushes with fewer canes, but it can be a very useful trick on the larger plants. The next thing you should do when pruning roses is to cut back all the canes that overlap one another. This is important because once the leaves on the rose bush fully open, any overlapping leaves will start shading one another and will compete for sun light, making the plant less efficient in the long run and ultimately leading to fewer blooms. The more open the interior of the plant is, and the more leaves you can get sun light to, the more productive the plant will be. The final step in pruning your roses varies a little bit from one type or rose to another. For instance, most bush and shrub roses you are going to want to cut back the remaining canes about one third of whatever their current height is. That means leave two-thirds of the plant behind. 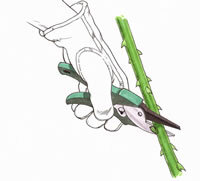 For colder regions, you may find that you have to cut the plant back a little more, to about halfway. The whole purpose of this is to promote new growth on the plant and many varieties bloom each year on the new growth. For the larger climbing and rambling varieties, this step is not really required as we often just allow these roses to grow as tall as they can get. You can however shape them to whatever support or structure you are growing them against. For instance an arbor or a trellis. For these roses, it's mostly personal preference and it has little to do with the overall health of the plant, provided that you followed the first two steps. Once you are all done with your pruning, this is a great time to rake up around the base of your roses and clean up all the dead leaves and debris that may have collected there over the winter or from the previous growing season. You never should allow decaying material to lay around the base of your plants as this can turn into a breeding ground for certain pests and diseases. Gather up all this material, along with your cuttings, and throw them away in the trash. Never throw this material into the compost pile either as some spores can survive even the cold winter months, only to re-infect your plants the following spring. Lastly, finish up by giving your roses a fresh layer of mulch for the new growing season.